David Sanderson has over 20 years experience in development and disaster risk reduction, working mostly for aid agencies. Between 1998 - 2006 David worked for CARE International UK as Head of Policy and subsequently Regional Manager for Southern and West Africa. Before that he worked for four years at the Oxford Centre for Disaster Studies. 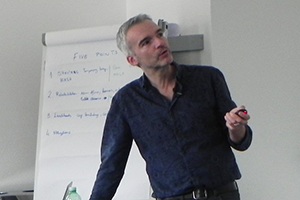 In 2006 David joined Oxford Brookes University as Director of the Centre for Development and Emergency Practice (CENDEP). In August 2014 David took up a post of professor at the Norwegian University of Science and Technology (NTNU) in Trondheim, working on urban disaster resilience and humanitarian aid. He spent 2013-14 at Harvard University as Visiting Professor. He is currently the Inaugural Judith Neilson Chair of Architecture and Design at UNSW Australia. David has experience of all stages of project management and has carried out work for agencies including Qatar Foundation, ADPC, ALNAP, ELRHA, ACT Alliance, DFID, Disasters Emergency Committee (DEC), DiPECHO, European Commission, Humanitarian Coalition (HC), USAID, World Bank (EDI Section), United Nations (UNDP/UNDESA, UN-Habitat), British Council, Christian Aid, Habitat For Humanity, CARE Bangladesh, Tear Fund, Save the Children, Oxfam GB, Islamic Relief, REDR, World Vision International and the Mott Foundation. David is a member of several humanitarian organisation committees and steering groups and is an Editor of PLoS One: Disasters and Jamba Journal. He holds a PhD in urban disasters and livelihoods and is a Visiting Professor at Université Paris-Est Créteil in Paris. He teaches annual courses at the Harvard Humanitarian Initiative (HHI), EOI Business School, Madrid, Oxford Brookes University and Université Paris-Est Créteil. David Sanderson teaches Disaster Risk Reduction at MASHLM.